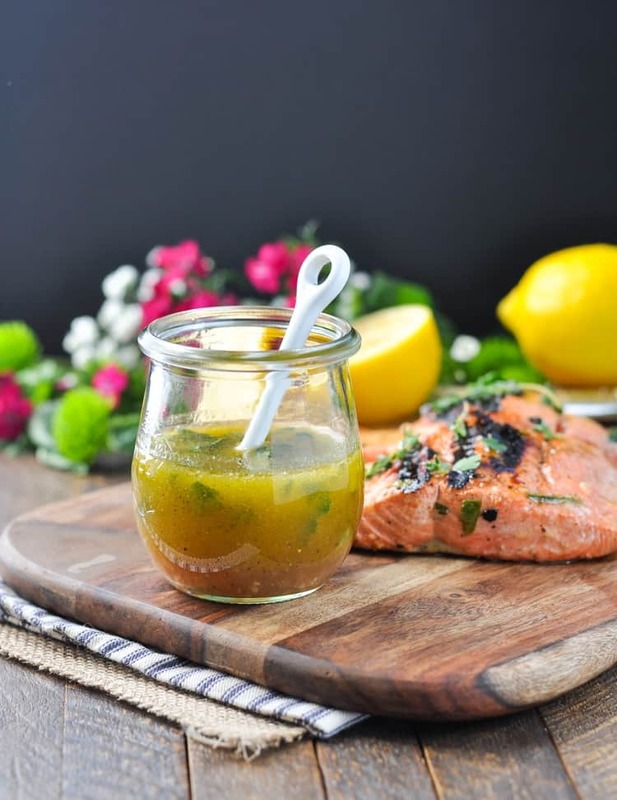 This garlic and herb salmon marinade is super easy and incredibly delicious. 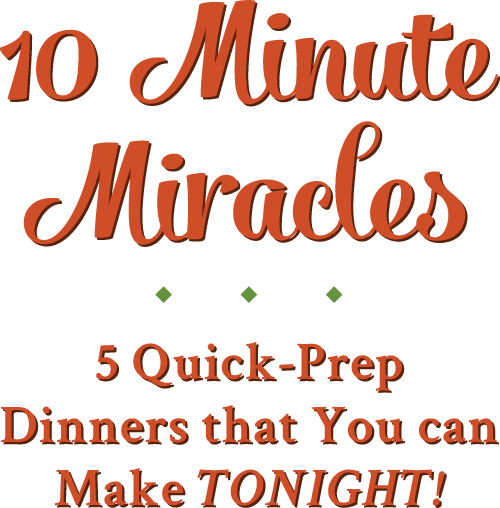 The perfect healthy dinner that can be on the table in only 15 minutes! 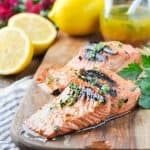 This Garlic and Herb Salmon Marinade is a flavorful and healthy way to enjoy an easy seafood dinner — in just 15 minutes! Hey, friends! As I sit typing this post, I’m staring out the window at a beautiful, warm, and sunny spring day. Spencer has spent the morning outside in the sandbox in shorts and a t-shirt, only briefly coming inside for a quick snack. We just finished a weekend of soccer games, outdoor play, and yard work. And after a winter of many cold, gray months, the sunshine is completely filling my soul (and my entire family) with joy! It is such a welcome sight. The warm temps have encouraged my boys to spend hours playing in the dirt (country living! 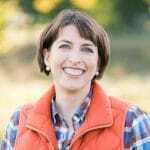 ); the abundance of fresh produce has encouraged me to reach for lighter, healthier groceries; and the balmy evenings have encouraged Keith to fire up his grill again. Regular readers of my weekly meals posts already know that grilling is a weekly (or bi-weekly) event around here at this time of year. It’s a great way to get Keith to help with dinner prep, and the smoky, crisp, charred meat just tastes so much better than its boiled or baked counterparts…especially when there’s a delicious salmon marinade involved! Salmon is one of my go-to options when it comes to healthy dinners, but eating the same exact meal week after week can get pretty darn BORING. That’s why I whipped up this Garlic and Herb Salmon Marinade for last night’s dinner. It only took me about 5 minutes to whisk together some olive oil, vinegar, lemon juice, and a bundle of fresh herbs from the garden, but the payoff was exponentially better than plain ol’ fish! Isn’t that exactly what a sauce is supposed to do? 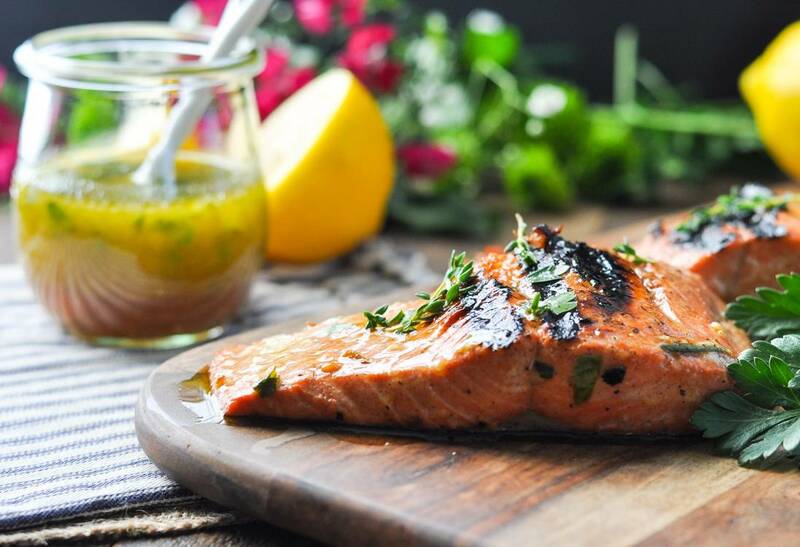 The fresh ingredients in this salmon marinade highlight the natural flavors and textures of the seafood in a light and subtle way. The marinade doesn’t dominate the dish — it just makes it taste even better than it otherwise would. I hope that you’ll mix up your regular grilled fish (or chicken!) 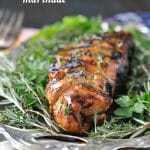 with this simple marinade that takes advantage of flavorful, healthy ingredients. Your dinner will reflect the warmth and sunshine of the season — and your body and tastebuds will thank you! Combine all of the ingredients (except for the salmon) in a large jar with a lid. Shake vigorously until completely combined (or whisk ingredients together in a small bowl). Set aside about ¼ cup of marinade for later. 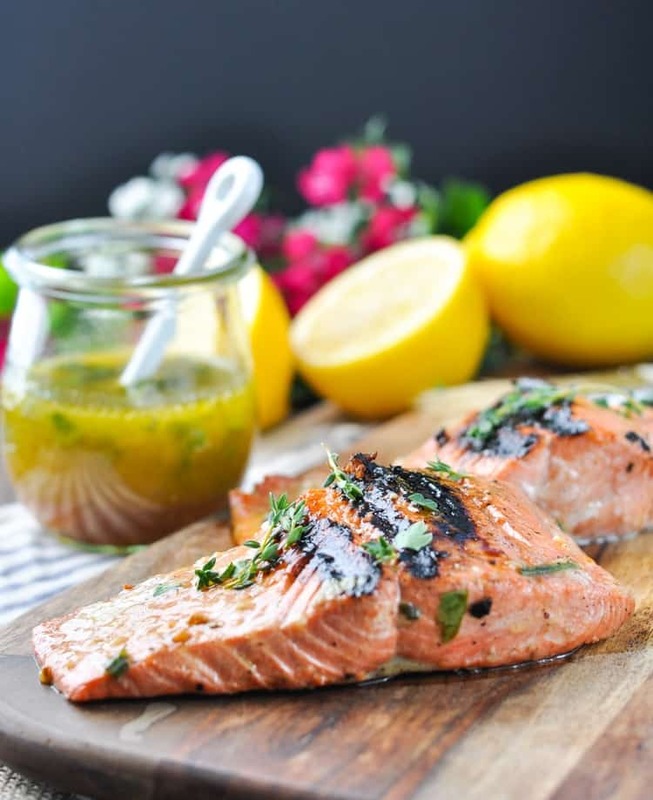 Place salmon and remaining marinade in a large zip-top plastic bag or in a glass container. Place in the refrigerator to marinate for about 30 minutes (and not longer than 1 hour). Heat coals or gas grill. Remove salmon from the bag and discard marinade. Place salmon on the grill. Cover and grill over medium heat for 4-5 minutes per side. 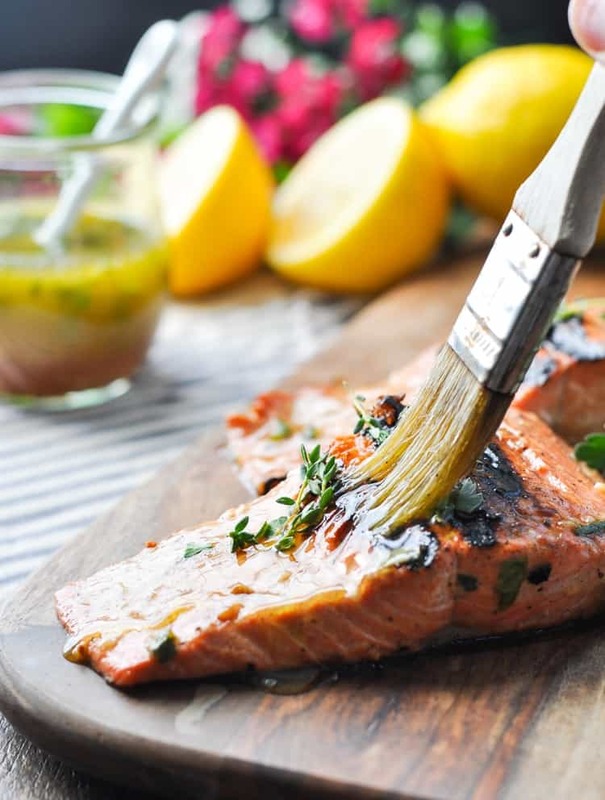 Brush the salmon with the reserved ¼ cup of marinade a couple of times as the fish cooks. The salmon is done when it flakes easily with a fork. This marinade is also delicious on grilled chicken! Isn’t this weather the best? I’m loving the spring and summer weather we’ve had lately too! This marinade looks perfect, Blair! I make salmon almost once a week, as my husband and I love it, so I will have to try this. 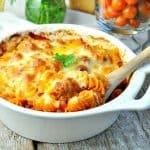 Sounds SO good and so easy to make! Love this time of year!! And any excuse to grill some salmon is welcome. 🙂 Hope you get a chance to try it, Gayle! Dinner tomorrow night! It is time to start grilling even with unseasonable cool and wet weather. 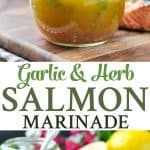 Best marinade for salmon!!!! Delicious. Would also be goid as a dressing! Thanks. 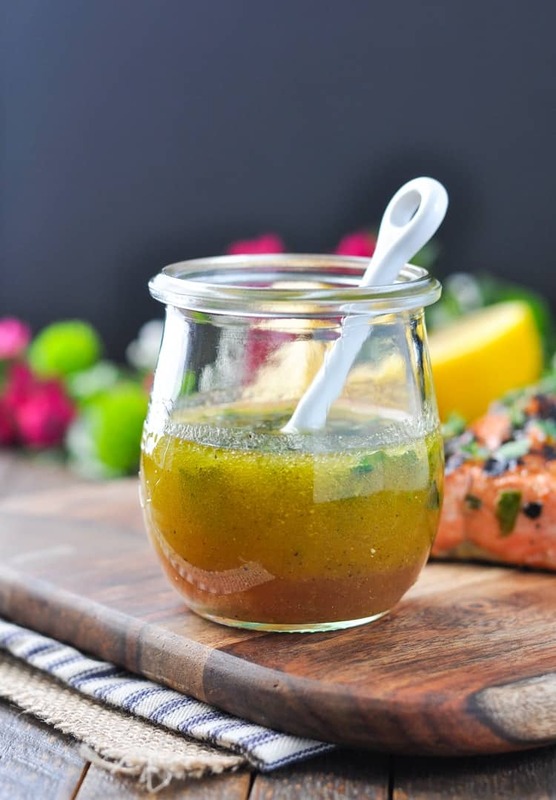 This salmon marinade is so simple and delicious, definitely need to try it on chicken too! Why not marinade longer than an hour? Is it a health thing or just too lemony if longer?? 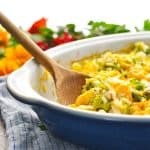 Any suggestions if you want to try the recipe on a stove top or in the oven? Hi, Savannah! Sure! You can marinate the salmon in the same way, and then bake it in the oven at 450 degrees F for 10-12 minutes (or until it flakes easily with a fork). On the stovetop, you can sear the marinated salmon in a skillet. To do so, heat about 1 tablespoon of oil in a large skillet over medium heat. Place salmon, flesh-side down, in the hot oil. Cook for 2-3 minutes, and then flip salmon with a spatula. 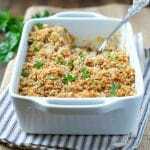 Cook for about 5-6 more minutes, or until skin becomes crispy and fish flakes easily with a fork. Hope that helps, and enjoy!